Happy New Year! I hope that 2016 will be a happy and prosperous one for you and your family. I’m happy to report that 2015 was another year of growth for Yvieknits Yarns as I increased my sales by 15% from last year, now have a second yarn store placing orders on a regular basis, and launched two new yarns. I introduced my two new laceweight yarns, BFL/Silky Select Lace and Silk/Linen Select Lace, at my annual trunk show at The Loop in Halifax, Nova Scotia in May. I was very happy with its reception and the attendance at this event. and lotions to sell at my open houses. In addition to my open houses and the trunk show, I was a vendor at six other events throughout 2015: Chesterville Spin-In, The Gathering in Port Hope, Twist Fibre Festival, Almonte Fibrefest, Ottawa Knitting Guild vendors’ night and Needlers Retreat vendors’ night. 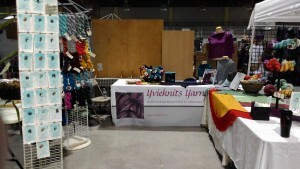 This was my first year being a vendor at the Almonte Fibrefest and it turned out to be my most successful event so far. There were 4 new patterns released this year that suggest using one of my yarns: Prairie Fire shawl by Ash Alberg and three patterns by Karin Bole Tupper: Matinée, Matinée II, and Velloso which was just released. On the retailers front, since June I now send regular shipments of my yarn to Ram Wools Co-op in Winnipeg, MB as well as continuing to send regular shipments to The Loop in Halifax, NS. In September, I delivered my first yarn order to Yarn Forward in Kanata, ON (they only carried my silk hankies before). I would like to start 2016 with yarn giveaway. This year I’m giving away a skein of my new Silk/Linen Select Lace yarn in either the Cosmopolitan or Caribbean Waters colourway (the winner’s choice). 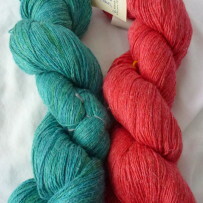 These two skeins are still listed on the Silk/Linen Select Lace page so you can see the details but I have temporarily removed the “add to cart” buttons. I will use a random generator to pick a winner on January 5th. Note: Do not worry if your comment is not displayed immediately. I manually review all comments that my anti-spam filter flags as spam every day and I will restore your comment. Im planning on making the same top as yours! Happy new year? I would love to make a top for my mom or a shawl for me. Happy New Year! I love the top that you made with this yarn and am planning to knit one myself this year! Happy New Year – hope that it is happy and prosperous! How lovely! Love this Cosmopolitan shade! Difficult to say, I would probably knit a shawl! Caribbean Waters! Mmmmm, so pretty. I honestly don’t know what I would make…but it would have lots of lovely friends in my “super specialty yarn” collection that I have because of yarn enablers such as you. Congratulations on your successful year! Cosmopolitan would be my choice to make the Jeweled Cowl with. I think it would look stunning beaded and worn with all the black I have in my wardrobe. 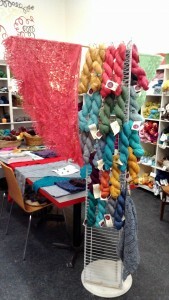 Love your yarns Yvonne! All the best for the new year! I would love to make Sea Salt Cowl by Keli Hansen in either color of your gorgeous Silk/Linen Select Lace…..such beautiful yarn! Happy 2o16! Let’s think positive! I will make myself a lacy cowl that can be showy for work and cozy at home on a cool day. I would choose Cosmopolitan (I think your “red/pink/fuchsias are always what draws me!) and make one of Romni Hill’s shawls from her “new Lace Knitting” book. It also has to have clear beads. I would use Caribbean to make a Drekin shawl. It’s a lacey pattern with a brioche spine. Very beautiful! i would make some lapel pins and fingerless mitts. It’s too difficult to choose between these two beautiful colors! My idea would be a lacey tank for summer! I would choose the Caribbean colorway, and probably loom knit a shawl for me. I’m so glad you offered the silk/linen skein, since I’m allergic to wool! I want to get into making shawls so I would pick a shawl pattern! I like the pink skein the best. I would knit the Eiffel Tower Shawl that I saw on Ravelry! I just love this green yarn. My daughter has blue-green eyes and I can fantasize about knitting a cowl or a shawl for her! Thanks for starting the year with a giveaway! And because I’ve been coveting the SL Select, I’d make the Nesoi Tee. I would definitely knit a shawl (but at the moment I can’t decide which one).